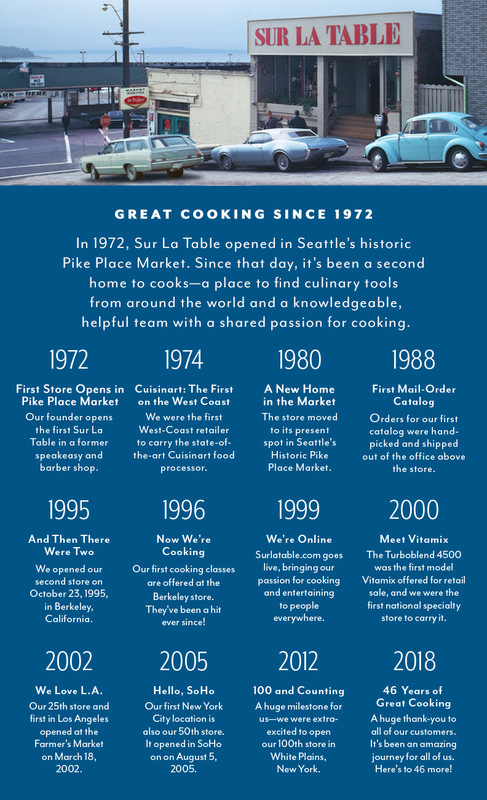 In 1972, the first Sur La Table store opened in Seattle’s Pike Place Market. It was a place where serious cooks found a surprising selection of culinary tools from around the world, with helpful, knowledgeable employees who loved cooking, too. We’ve now grown to more than 100 stores across America, with a website and catalog viewed by millions of people each year and a highly regarded cooking class program. But some things haven’t changed: we’re still the place for an unsurpassed selection of exclusive and premium-quality goods for the kitchen and table. We’re still passionate about cooking and entertaining, eager to share all we know. Our first store was small and without frills, and the shelves were stacked high with unique and hard-to-find kitchenware from around the world. We’ve come a long way since then, but regardless of the changes, that original, quirky little store clearly set the tone for what Sur La Table is today. Sur La Table stores are the ultimate place for kitchen exploration and discovery. From helpful, knowledgeable staff and in-store cooking classes to the products we source, we help every customer feel inspired to create memorable meals. An extension of our in-store experience, our website offers the best possible opportunity for customers who want to research products, shop or find helpful advice and inspiration to feel rewarded the next time they're in the kitchen. We're a useful resource for those eager to learn and keep learning. With instructional kitchens in more than 50 locations, ours is the largest avocational cooking school in the United States. Our selection of products is a true celebration of cooking and entertaining. If it’s in the kitchen or on the table, Sur La Table has it—from the everyday to the hard to find, even the unexpected. We’re a hardware store for cooks. With more than 40 years of knowledge and passion for cooking, we've selected products that enable you to feel comfortable and confident in the kitchen. From the do-it-all stand mixer to handcrafted Japanese cutlery, we have an unsurpassed selection of products to get the job done. Plus, we're eager to empower future generations of cooks with tools, tips and inspiration for the kitchen and table. Fun, hands-on classes for beginners to experts. We know you love to cook, that’s why we offer active, hands-on cooking classes in many of our stores. As one of America’s largest avocational cooking class programs, we travel the globe to stay on top of emerging cooking trends and are quick to bring these to life to inspire you in the kitchen. Whether you are a beginner or an expert, we provide a place for all ages and skill levels to learn professional tips and techniques. Our instructors have a passion for food and will teach you how to chop, dice, julienne, sauté, braise, deglaze, fold and even hone and sharpen your own knives. Our courses open up a whole world of food and culture through a variety of themed cooking and skill classes. Most classes are hands-on and focus on global and seasonal cuisine or techniques. Young or old, starter or advanced, if you have a desire to cook our classes are for you.